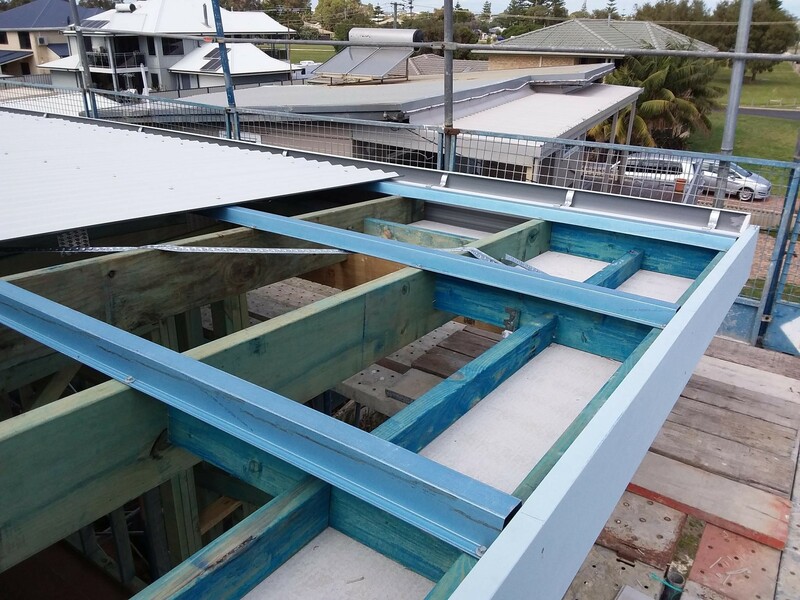 If you are building a new style double storey home in WA, quite possibly the upper floor will not be the traditional double brick on a concrete slab but a wooden framed upper floor, wall and roof frame, and generally with a metal roof cover. Noting that 85% of new houses in Australia are framed homes and not double brick homes, that has uniquely been the WA norm for over 50 years, it is not surprising that the wooden framed trend is growing in popularity in WA in recent years. There are pros and cons of upper level double brick on a concrete slab versus framed homes and these will not be explored in this document. However, the construction methodology differences are quite stark and hence a different approach needs to be taken with staged construction inspections. Upper floor, wall and roof inspections are a significant and critically important inspection along the construction journey. 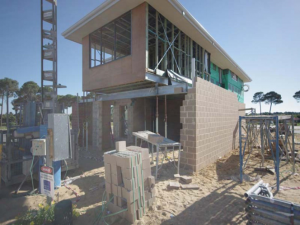 In WA, there is a new trend of constructing the upper level of a two storey home on a wooden frame (floors and walls) as opposed to there being a concrete slab and double brick walls on the upper floor. 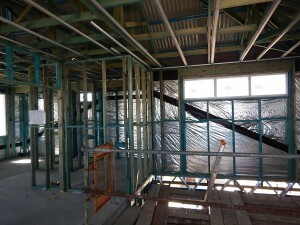 Once constructed, the upper floor frame will be covered with boarding as the basis of the eventual floor. The internal and external wall frames are then constructed and almost immediately after, the roof frame will also be constructed, as the same trades are used for floors, walls and roof frames. 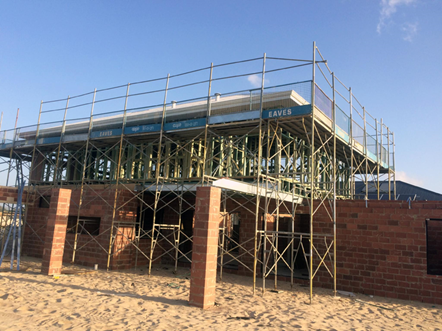 Given the scaffolding will be required to facilitate the construction of the roof frame, the roof cover (tile or metal) and roof plumbing will be installed immediately after the roof frame which makes efficient use of the scaffolding whilst it is in place. As the scaffolding comes down, the external wall cladding will be constructed, if not already completed. The external cladding may be a single brick wall or a broad array of wall claddings which may or may not be finished with a texture coat. Essentially upper floor, wall and roof inspections on a wooden framed upper floor represents up to three traditional construction inspections. 2 So What Is the Issue? 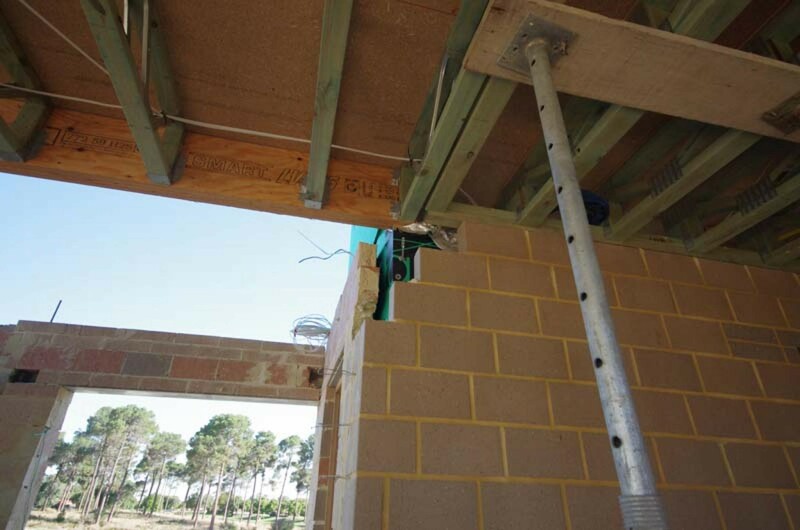 Frame constructions are complex and the construction does not always go to plan. The WA Building Commission published a report in 2016 (COMPLIANCE REPORT: A summary of technical building inspections 2015-16) which indicated that of 651 roof inspections undertaken by the Commission, 37% were unsatisfactory. The findings were updated in mid-year 2016/17 and published. Positively, the overall position improved, but sadly 33% were still unsatisfactory. The key takeout and based on these numbers is that almost 1 in 3 new homes could have defects. In WA, roof carpenters who also construct the walls and floors are not licenced or regulated and yet they are tasked with building a very complex component of a new home. Builders, with the support of their site supervisors, self-assess the construction of these frames. 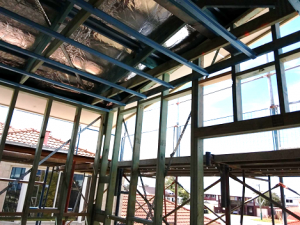 Alternatively, the frames may arrive on site prefabricated and are required to be assembled in accordance with Manufacturer’s instructions, Structural Engineers requirements and compliant to Australian Standards and National Construction Codes. Given its inherent complexity, it is hardly surprising that on occasion issues can arise. So the challenge here is that it is acknowledged within the construction industry that there can be a number of issues with the construction of frames. There are two main issues that we come across. 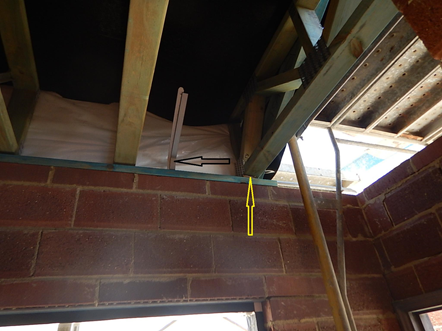 Firstly, are the right timbers in the right location with the right support? Simple really- every home has a very clear construction plan. 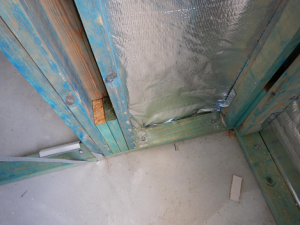 Secondly, has each timber been connected, bolted, strapped and tied exactly as the Engineer required. Where these two key items have been undertaken in full you will have a well-constructed frame. 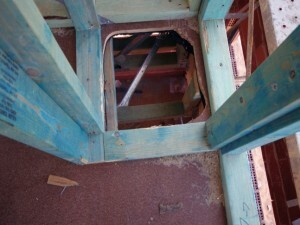 Where they are not, you could end up with a structural defect. 3 There Can’t Be that Many Issues Can There? Sadly, yes there can. 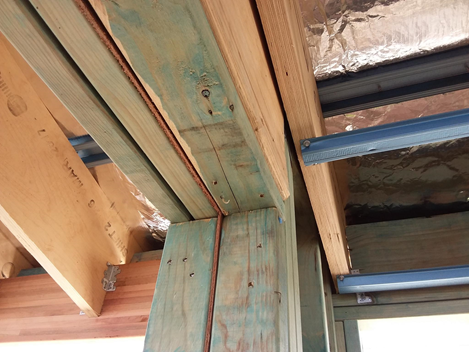 Here is a small selection of actual roof framing issues identified in WA in 2017. 3.1 The multi grips were only nailed on two sides on areas that could be seen. 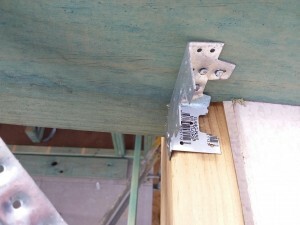 3.2 The top level on the south side of the roof frame is compliant with AS1684. All other parts of the roof frame require triple grips in lieu of multi grips to be compliant as they are not to the plans. 3.3 The ceiling at the north-west corner of the scullery requires some packing at the ceiling joist adjacent to the outside wall. It runs up by 6mm on the last two ceiling battens or top hats. 3.4 The LVL beam over the sliding door to the upstairs living area is protruding beyond the frames at both ends of the doorway. It appears to be bent inwards towards the middle of the doorway opening. Some rectification is required at the ends to keep the wall sheeting flush. 3.5 The gutters were not very straight on the south side of the top floor of the house. The join needs to be straightened on the north and south side of the top floor roof. 3.6 A hole has been cut through the upper floor for a service duct and the top chord of the floor truss has also been cut and a web is detached. “Being fully engineered components, any modifications made on site to Pryda Span floor trusses are not permitted. 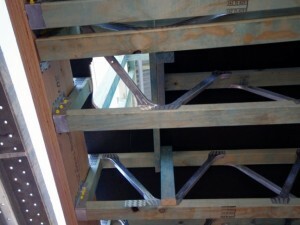 Floor trusses must not be notched, drilled, cut or altered. 3.7 The upper floor pod has not yet been secured to the ground floor upstand tie downs off the lintels, rods or straps as yet. These items are still accessible after the scaffolding is removed. The simple solution is to have your floor, wall, roof frame and roof cover checked by an independent Houspect Building Inspector. 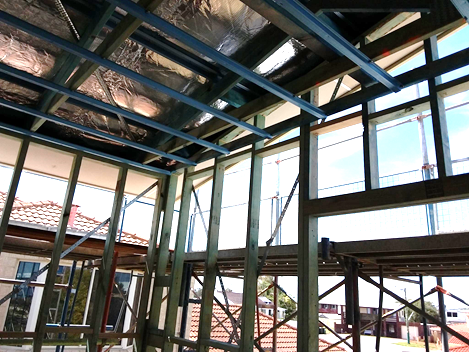 Armed with the approved Engineers Plans, a good knowledge of the Building Code of Australia AS 1684 and many years of experience, your Houspect Building Inspector can review the work undertaken on site so that you can be assured that the roof frame has been constructed as approved. 5 When should the upper floor, wall, roof frame and roof cover Be Inspected? The best time to inspect all of these important elements and in accordance with OH&S requirements is when the scaffolding is still in situ, and the roof cover and roof plumbing has been completed. This provides the inspector with the best opportunity to review the roof cover and the roof framing, wall framing and floor framing. It is critical that these inspections are undertaken prior to the ceilings being installed on either floor and or the internal wall cladding being installed. 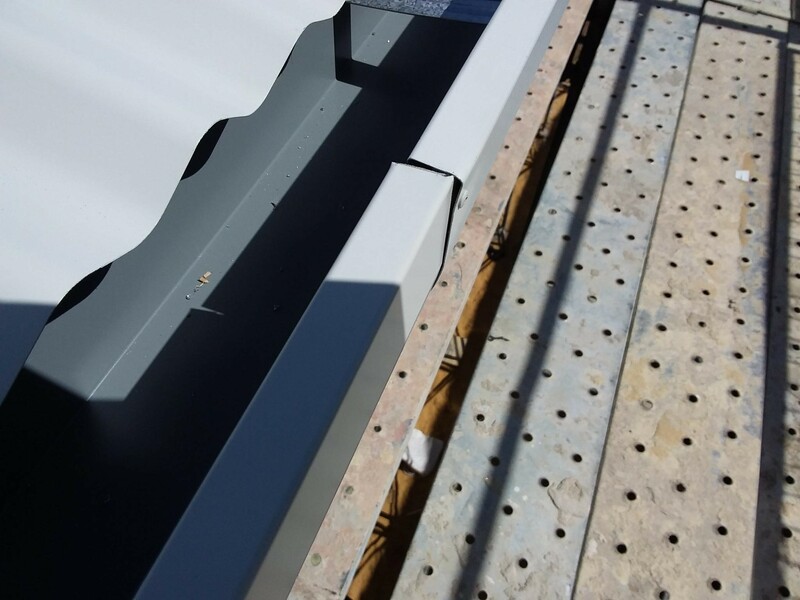 External wall cladding can be inspected at the next construction stage, if it has not been completed when this inspection is undertaken. 6 Can Upper Floor, Wall and Roof Inspections be Undertaken at the Practical Completion or Handover Inspection? Essentially no, these inspections cannot be undertaken at the PCI or the Handover Inspection. The key issue is that the floor framing and key components of the roof frame will have been covered by subsequent construction stages. The wall cladding will have covered all of the wall frames and the scaffolding will no longer be in situ, so we cannot effectively see the roof cover and roof plumbing. 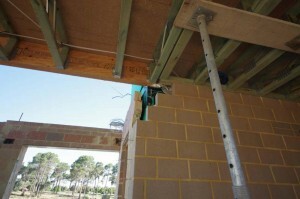 The ceilings will have concealed the floor frame and key components of the roof frame. 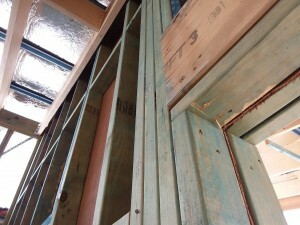 In essence, key construction elements can only be inspected during the construction journey during a relatively small window. If this opportunity is lost and there is a defect, the first time you become aware of the defect is when it manifests into an issue on your property. Floor, wall, roof frames and roof covers are a critical part of your home construction. There is substantial evidence that there can be significant issues associated with compliant construction of floor, wall and roof frames. The WA Government has issued detailed reports to validate this position. Trades engaged to construct floor, wall and roof frames are not licenced in WA. Compliance is based on self-assessment by the builder. There is a relatively small window during which these items can be inspected, prior to much of these construction elements being covered by subsequent inspection stages or scaffolding being removed. 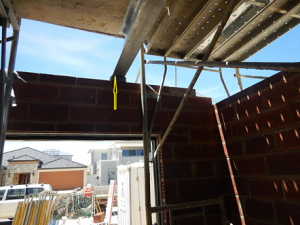 There are significant problems in the correct construction of frames in WA as evidenced by the WA Building Commission reports which indicated potentially up to 1 in 3 homes have roof framing issues. 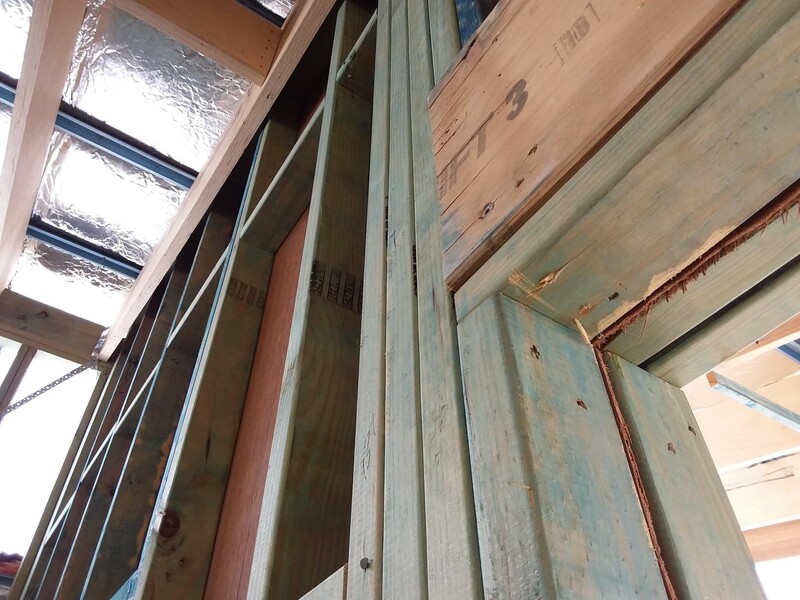 The construction of wooden framing is governed by the Building Code of Australia, Australian Standards 1684, Engineers Plans specific for the individual property and Manufacturer’s instructions. These requirements need to be followed exactly.